Delicious way to make your morning oatmeal way more exciting!! Add the oatmeal and splenda into a microwave safe bowl. Add in 2/3 cups of water and microwave on high for 1 minute and 30 seconds. Add the blueberries and cream cheese and microwave for about another minute, or until the oatmeal is fully cooked and the blueberries have began to split. 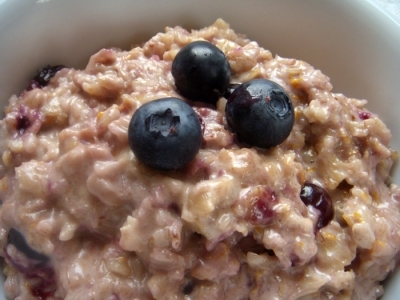 Stir the oatmeal so that it becomes creamy and full of delicious blue streaks.